For some people, Ford tractors have always been a way of life. Mold based engineer Gareth Jones is one such person with Ford tractors having played a significant part in a varied career. 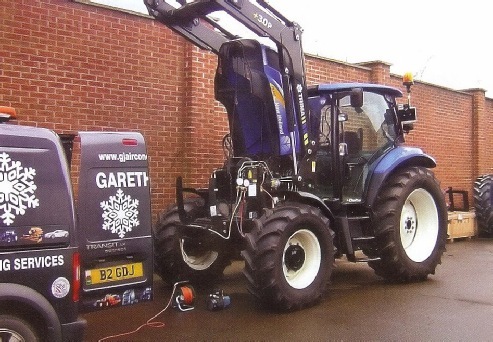 After completing the agricultural engineering technicians course at Reasheath College, Gareth secured a job as a mechanic with his local Ford and New Holland dealer, Ruthin Machinery Sales Co. Ltd. It was the time of the 7A series of Q-cabbed tractors, 550 TLBs and H45 excavators, (the Richer based excavators). It was also the era where it was common to have a long list on the sales office wall, which detailed the customers that were waiting for new tractors. These buoyant times meant every one was always busy and trade was excellent. Gareth attended several training courses at Boreham House (Ford) and Aylsbury (New Holland) which were initially on service, then on to sales and, latterly, the fascinating world of parts merchandising. After a number of years in the workshop, Gareth joined the sales team. His biggest deal was selling Lord Newborough not one, but eight new tractors in one go, persuading him against buying Case IH (rather ironic now that it is CNH). John Baggerley, who was the area tractor demonstrator, helped deliver some of the tractors with is Ford Transcontinental, which Gareth thinks is still an impressive truck today . Gareth Jones hands over the keys to eight new tractors, bought by Lord Newborough , in February 1985. “I can still remember John walking into the sales office with an aerosol labelled bull**** repellent” joked Gareth. With the introduction of computers and the merging of the agricultural and construction parts departments, Gareth was offered the position of managing the company's parts operation. In 1989 he won the Ford UK top parts manager award (the Topper club) and was presented with a trophy by Mike Richards, Ford’s tractor parts manager at the time. The award also enable him to visit the then Ford New Holland world headquarters and factory in Pennsylvania USA. Three years later with the support of is wife Denise and 2 children Claire and Daniel, Gareth decided it was now or never to setup on his own. “Work was initially servicing and repairing agricultural equipment, as well as selling parts. Gareth explained. “As farm incomes started falling, mainly due to BSE and and Foot and Mouth, we decided it was probably time to specialised, deciding on vehicle air conditioning. To retain credibility , Gareth undertook several courses including City and Guilds,CITB, and Quarry Safety Passport. Denise and Gareth initially thought that the air conditioning side of the business would run alongside the agricultural work, but it has virtually replaced it. A wide variety of vehicles ranging from small cars, prestige cars, to tractors excavators and trucks are Gareth's bread and butter work. After working in an office with the NHS for 19 years Denise took early retirement and now works alongside Gareth. Gareth (left) being presented with the Top UK Ford Parts Manager’s Award from Mike Richards, Ford’s UK Parts Manager in 1989. Gareth works on a variety of vehicles, but still has strong feelings for blue tractors. 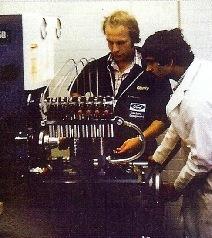 Gareth and Kali, an Indian student , at Reasheath College, calibrating a fuel pump. Article reproduced from “Ford and Fordson Tractors” magazine, Howard Sherren, October/November 2013.